I'm only sad that I had to cover Alex Burrows handsome face to take this picture... at least you get Kesler! Here it is, my obligatory Canucks post. I want this Stanley Cup wrapped up in four games because… it’s June. It’s summer. Don’t get me wrong, I’m a fan. I’ve shared season’s tickets for the last few years. I love going to games. But, it’s time for hot dogs at the ballpark and taking in a Whitecaps game. Not stale smelling ice rinks and below normal temperatures. It’s been exciting and fun. This city is hockey mad and I love seeing how it brings everyone together but, I want summer. So boys… get ‘er done. Eat those Bruins for breakfast. 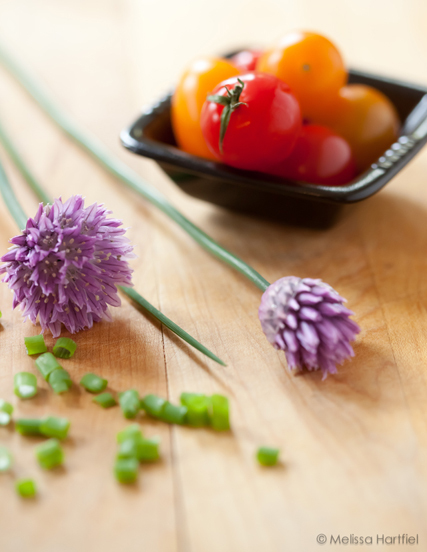 chives from my garden! yay! 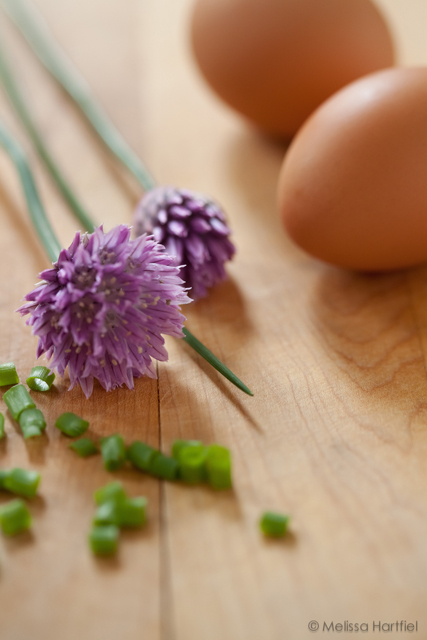 The miserable spring weather means everything is behind but, I’m very happy to say that I was able to harvest some chives and cilantro to make these eggs and nothing beats chopping up your very own fresh herbs that are still warm from the sun. The smell! It’s divine. So here it is… so simple anybody can make them. Mix and match your add ins as you please! easy to increase this recipe for more than one person, just multiply ingredients by the number of people you are cooking for. chives and tomatoes and I was trying to do an 8x10 crop. Not sure I like it. There’s nothing wonderful about this. It was a quick snap and the eggs are poorly lit. 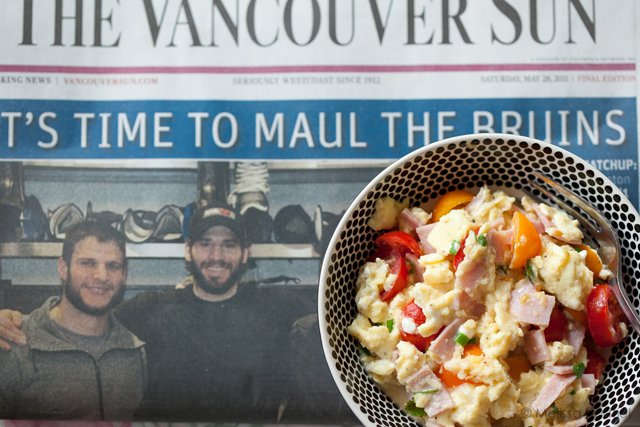 It was all about having a bit of fun with my morning paper and eating my eggs before they got cold! Somehow, though, I think it works! I have a love affair with photographing chives as my flickr stream from last year with attest to. They’re so delicate yet so hardy – coming back year after year no matter what the conditions are. This was my first time shooting them indoors and I was experimenting with backlight again. I had a reflector positioned in the bottom right corner, held in place by my fruit bowl. If the image was a clock, the reflector was at about 4 and was reflecting the light back to about 10. The chive flowers are still a bit darker than I would have liked but I think that’s in part to how I had the eggs situated. A second reflector or mirror might have helped. I wouldn’t it this for breakfast (I’m totally not into warm/cooked breakfasts), but I could totally see myself eating these eggs for a cozy home alone dinner.